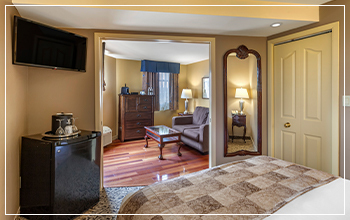 Pamper yourself and your romantic partner in a Premium hotel room at The Parlour Inn. 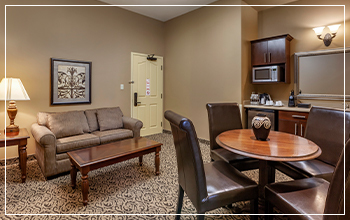 Our Premium accommodations are perfectly suited for a weekend away or extended stay in Stratford, Ontario. 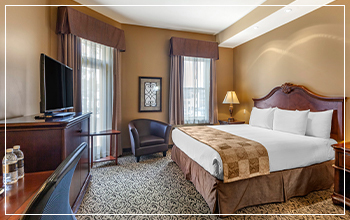 From its elegant atmosphere to the wide array of luxurious amenities, this Premium Room will revitalize you and rekindle your romantic flame. 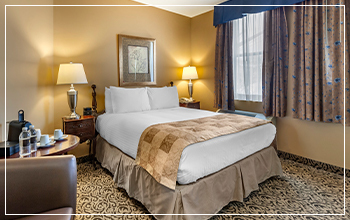 Our premium rooms’ spaciousness and amenities will help conference goers and tourists to enjoy a relaxing respite away from the hustle and bustle of a busy schedule. 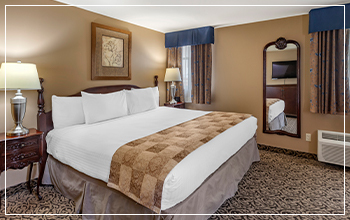 The Premium Rooms offer an exceedingly comfortable King Bed. This spacious mattress makes you feel right at home, helping you to enjoy a peaceful night’s rest. The mini fridge will keep your healthy snacks fresh, so that you can start your day off on the best possible foot. The Premium Room’s 3-piece bath is perfect for preparing yourself for a night on the town, while the additional 2-person luxury Jacuzzi tub within the bedroom is essential for an enjoyable night in. 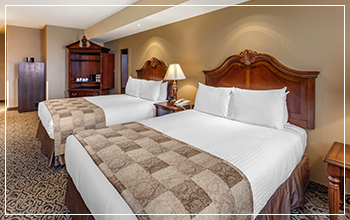 Located in the heart of downtown Stratford, your Premium hotel room is walking distance to each of the Stratford Festival theatres. Benefit from free parking in our spacious lot, so you never have to worry about running late for a production or paying for a parking space. Stroll out of your spacious hotel room to experience Shakespeare Gardens, Stratford’s famous swans, and the outdoor artisans that add colour and culture to our streets. Prepare for the perfect stay in Stratford by booking a Premium guestroom at The Parlour Inn. Book now or contact our helpful staff today to learn how to make the most out of your Ontario escape. We look forward to helping you enjoy an exceptional vacation or business trip in downtown Stratford.